The Best bbq, service & blues anywhere... every time! 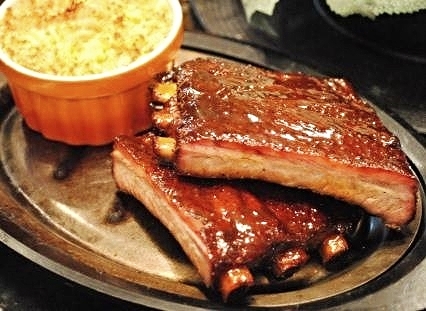 Slo' Bones is a barbecue restaurant with a full bar & lunch specials in Frankenmuth, Michigan. Enjoy family barbecue during the week with live bands on the weekend. Slo' Bones was born from the passions & travel of Jim Jones. The idea emerged to serve Frankenmuth with the best barbecue & blues music in Michigan after traveling extensively to the best smokehouses & blues joints in the country. Jim came back from his journey to share the taste of Southern 'cue with his community. Come celebrate slo' cookin', soulful jams & award-winning cuisine with us! We provide quality smoked barbecue in a bluesy atmosphere with a menu full of mouthwatering ribs, brisket & pulled pork with a twist to classic sides. The nature of the barbecue process allows a prompt lunch with a reward for our loyal friends who join the Lunch Club. We've always got something fun up our sleeve so check out our events for the latest gigs & our news for day-to-day highlights. Can't wait to see you at Slo' Bones! Slo’ smoked wings tossed in your selection of sauce or sent out naked for you to create a special concoction of your own from our table sauces. Cut off of the Pit Masters specialty Brisket, we send them out to you just the way they are. Smoked pulled pork or smoked chicken with red onion, sweet peppers, tomato, black olives, and a blend of asiago and mozzarella cheese. Salsa and sour cream included. Slices of chicken breast dipped in the house beer batter, fried, and then tossed in your choice of dressings or sent out naked for you to create greatness with. Fresh cut and fried tortilla with house salsa. Our classic Mac & Cheese revved up with jalapenos and bacon then breaded and deep-fried. Pork or Chicken served with Mixed Cheese, Lettuce, Tomatoes and Haus made Salsa & Cilantro Sour Cream. A combination of smoked brisket, pork and ground chuck are added to rustic beans and tomatoes to build this hearty comfort food. This might be the best soup you've ever had!! A blend of crisp lettuces with carrots, radish, red onion, and croutons. Char-grilled chicken breast atop fresh field greens with avocado, cucumber, roma tomato, and red onion. Romaine lettuce, Caesar dressing, grated Parmesan, and croutons. A lighter version of our HAUS salad. The Pit Master’s pulled pork, cheddar cheese, pickles, and grilled onion. Delicious smoked turkey with mayo, bacon, lettuce and tomato. Marinated seared chicken breast, roasted tomato, caramelized shallots, swiss cheese, creole sauce. 1/2 pound chuck, lettuce, tomato, and pickle. 1/2 pound chuck, cheddar, bacon, fried egg, mayo, Texas Tang BBQ Sauce, lettuce, tomato & grilled onion. 1/2 pound chuck, smoked brisket, smoked pulled pork, smoked bacon, Texas Tang BBQ Sauce, cheddar cheese, coleslaw, pickles and Bama Slo' Sauce. Includes small drink & one side. 10 & under only. SLO' COMBO - your choice of any two HAUS smoked meats. Marinated char-grilled chicken breast with cajun rice. Delicate fillets lightly breaded with our cajun seasoned cornmeal and quick-fried. Served with creole sauce. The Pit Masters pulled pork over penne pasta in a BBQ alfredo sauce. Fusilli pasta with smoked cheddar, smoked gouda and parmesan cheese’s topped with a toasted savory bread crumb. THE PIT BAKER - Jumbo baked potato with brisket, pulled pork, or pulled chicken with cheddar, sour cream, and green onions. LOADED BAKER - Jumbo baked potato smothered in bacon, cheddar, sour cream, butter and green onions. SPECIAL OF THE DAY!! Open face pulled pork sandwich. Monday - Kids 10 and under Eat FREE! * This offer is valid for one kids menu item per purchase of an adult entree at regular price. Includes soda, milk or juice. Premium drinks are not included. Taco Tuesday! How does this sound? Corn tortillas pan fried and hand molded to form the perfect crunchy, yet pliable taco shells. Smoked Pulled-Pork gently tossed with Slo’ Bones very own haus made BBQ sauces, garnished and topped with a delicious haus made cilantro sauce. Wednesday - Award Winning Wings And Pulled Pork Sliders Wednesday! Winner of the 2015 Kings of the Wings Competition at the Dow Event Center in Saginaw! Friday and Saturday - Live Music!!! Slo’ Sauce- Our signature haus’ made sauce with the perfect amount of sweetness. Texas Tang- Sweet and thick with just a touch of heat. Flaming- Turning it up a notch, this sauce is made with fresh habanero peppers. Slo’ Burn- So HOT it comes in a flame red bottle. Made with both fresh habanero and ghost peppers. Delivery & Set-Up: We will deliver to any event, set up where ever you request. Disposable plates, silverware and napkins are available @ $1.00 per guest. 5 miles or less - $4.50 fee, 5-20 miles - $20 fee, 20 miles or more, $20 plus .56 cents per mile. Full Service: Your guests are sure to enjoy themselves with our catering team providing excellent service. Disposable plates, silverware and napkins are available @ $1.00 per guest. From set up to tear down, choose your menu, and we will do the rest. Waitstaff is available at an hourly rate. Dine in Buffet: We offer a semi private room that can be reserved for your celebration or business event, Depending on the date of your event, there is an additional charge for reservations. Our room accommodates 40 guests with a buffet option and 50 guests if ordering off the menu. The catering team at Slo’ Bones BBQ Smokehaus will provide everything you need to ensure your event is a success. Buffet tables are skirted and topped with black linens. Guests tables are also topped with black linens. A member of our waitstaff will be dedicated to taking care of your guests needs during your event. A 17% gratuity is in addition to food and beverage costs.